My creative partner Jenny Mathews is a great illustrator. She is also a feminist. When she set her mind to creating a chart of Freshwater Mermaids indigenous to bodies of water in the Midwest, I knew it wouldn't be the same old fairy tale of the mythical creature. Freshwater Mermaids are something I started working on when doing a public art project for the city of Beloit, WI, when I painted my first river mermaid. In thinking about our local waterways, it occurred to me the mermaids we are accustomed to seeing are ocean mermaids. We see them starring in movies, advertisements and in popular culture all around us. This same pop-culture has taught us mermaids have long flowing locks complimented by beautiful sparkly and graceful bodies, but I looked again at the river I grew up near, the Rock River of Northern Illinois. Some of the largest and deepest fresh water collectives are right here in North America. I began to wonder what might be lurking right beneath our noses in the heartland, perhaps something a little different from what we have come to expect of a mermaid. I surmised, if freshwater mermaids live far north in the Great Lakes and the areas deep rivers that obviously, as proven by their elusive nature and given the intrinsic feature of a lake being all enclosed, fresh water mermaids do not migrate in the winter. Smaller, cold-blooded swimmers, with gills, best tolerate staying in their same habitat during cold and icy months by moving towards the bottom of lakes and rivers. Therefore, while the famed oceanic mermaids have lungs and tails that move up and down like other warm-blooded swimmers, freshwater mermaids have gills, a smaller stature and vertical tails that propel with a side-to-side movement like most cold-blooded swimmers. In response to the utterly contained habitats that these freshwater mermaids experience, generation after generation in the same lakes, they have become extremely specialized with unique adaptations, spines and extra fins abound much like the evolution of animals on an island. Some of the smaller lakes are constrictive and the food supply limited causing the species residing there to be surprisingly small as seen in the few specimens we have in museums referred to as Fiji Mermaids. Once I realized what I was looking for, it was easy to document what Freshwater Mermaids look like. Their once illusive figures and faces revealed themselves to me every day and I could hardly sketch fast enough. Unlike their glamorous saltwater sisters, they are as varied in shape, size, and character as the women you see all around you. 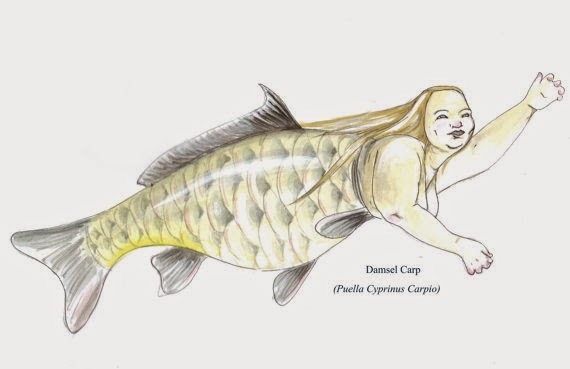 The Damsel Carp is just one of 17 amazing mermaids you can buy now at Jenny Mathew's Etsy shop, Rockford Illustrating.